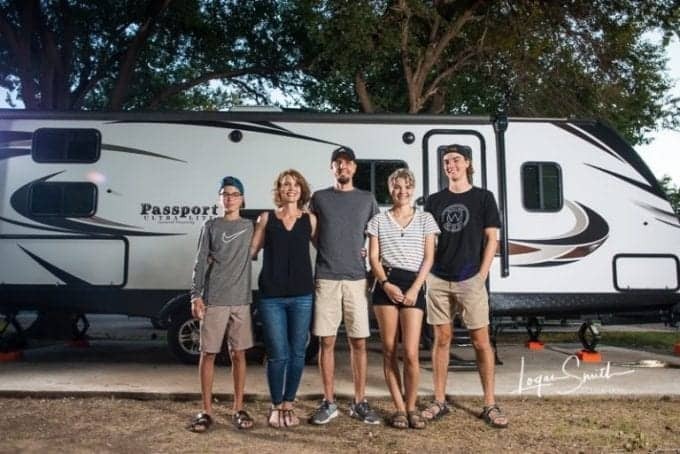 Whether you’re moving into your RV to experience full-time RV life or you’re rolling out for an epic vacation, setting up your space to feel more like home is important. These 13 tips are simple and easy ways to make sure you create a space that’s relaxing and enjoyable. The day we signed the papers and officially made that Keystone travel trailer ours was such an exciting day, to say the least. I’ll never forget one of the employees taking us on a tour and explaining how everything worked. He was saying things like…don’t do this because it’ll clog your toilet and don’t do this because it could drain the battery and on and on. And I was trying to listen. Really, I was. But all I could think about was making it home. As he’s talking about clogged toilets (which is kind of a big deal) I’m staring at the curtains and thinking how they have got to go. 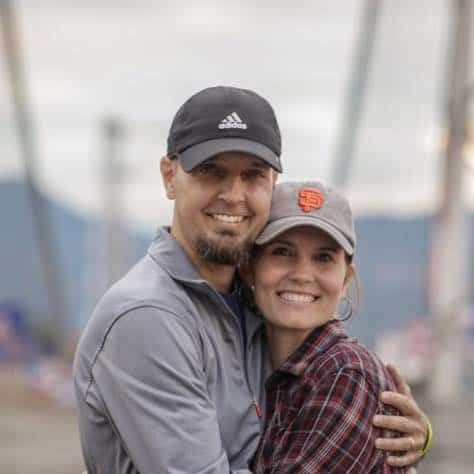 As I explained in our RV hacks post, Todd and I are not remodelers. We bought our travel trailer fresh off the lot and as exciting as ripping out the dinette, painting the walls and attempting to create some sort of workspace sounded, I knew it wasn’t happening for so many reasons. We were only planning to travel for one year (oops, we went over), so I wanted to do the bare minimum to make it feel like home. And it did feel like home. The first time Todd and I laid on our bed in the travel trailer, we knew we had a serious problem. It was hard as a rock. If we were going to get a decent night’s sleep, we knew something had to change. 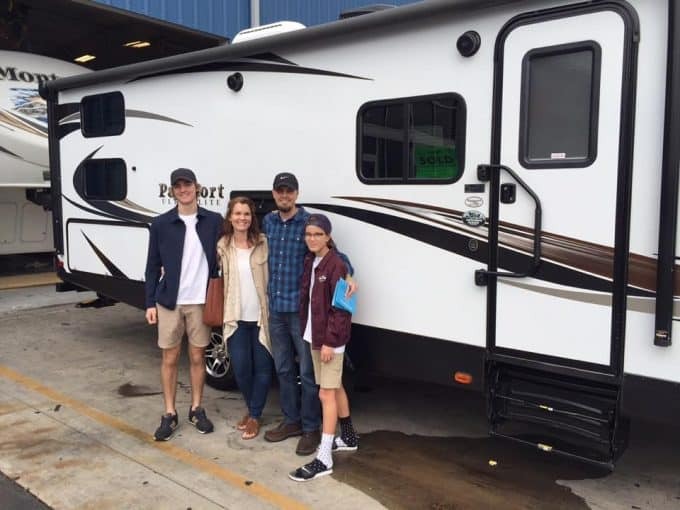 We had watched videos of other full-time RVers just taking their mattresses from their homes and putting them in their RVs. But ours was a California King mattress and there was no way in heck it was fitting in there. So we decided to take a chance and instead of spending hundreds of dollars on a new mattress, we bought this mattress topper. That mattress topper ended up being one of our smartest purchases. We used it the entire 17 months of travel and it created one very cozy and comfortable bedroom space. 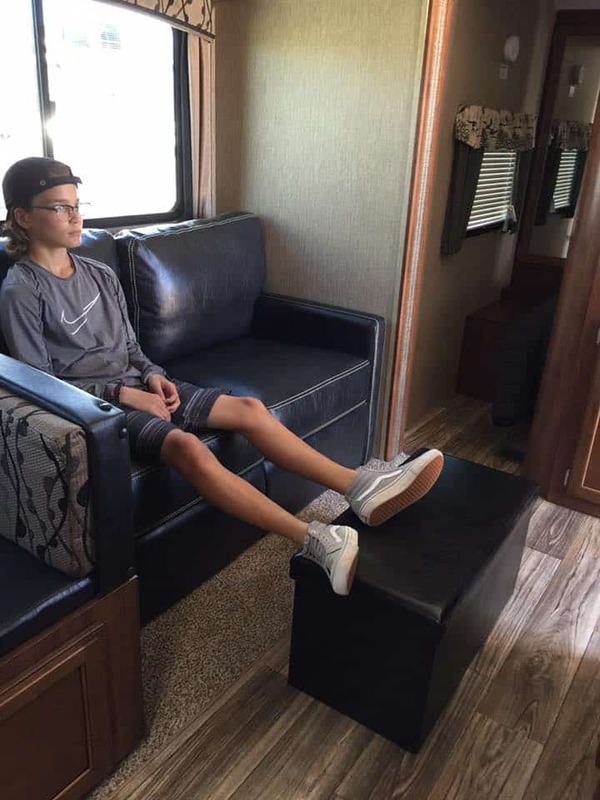 This is probably a no brainer for most parents, but letting your kids personalize their space in the RV is incredibly important. It gives them something familiar from home, which becomes crucial on the hard days that will inevitably come with full-time RVing. 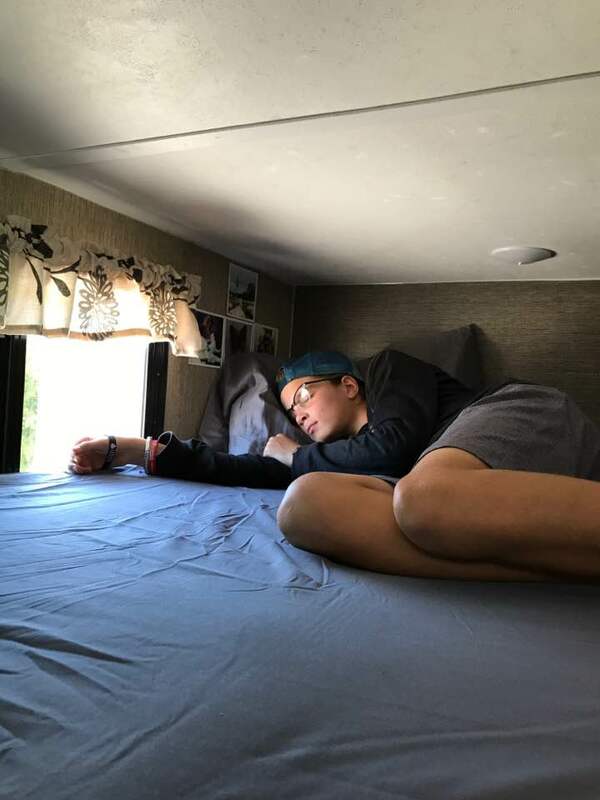 Between constantly being in unfamiliar places while traveling and unexpected mishaps on the road, RV life can be very overwhelming. Since our sons traveled with us full-time, they got dibs on the bunks. It didn’t take our youngest son long to start making his space his own by hanging pictures and hooks for his hats. He also had a small plastic storage drawer unit he used for storing electronic chords, his wallet, and other small items he kept in his bunk. And of course, everyone needs their favorite blanket and pillow. Our daughter who only traveled with us during her summer and winter breaks used the dinette as her ‘space’. She made it her own by taping up pictures under the cushions that came off at night. We also hung command hooks up in that area for her to use to hang necklaces, lanyards, etc. Next to the mattress topper, I’d say a storage ottoman is the second best item we purchased in order to make our travel trailer feel more like home. Storage space is obviously very limited in most, if not all, RVs so having another place to store our personal items was very much needed. When our daughter was with us, she used this to store her clothes. When she wasn’t with us, Todd used this for storing books he wanted to access easily and Aaron used it to store his school books. Not only was it practical for storage reasons, but it also made the place look homier. Plus, since our couches didn’t recline, it gave us a place to kick up our feet and relax. 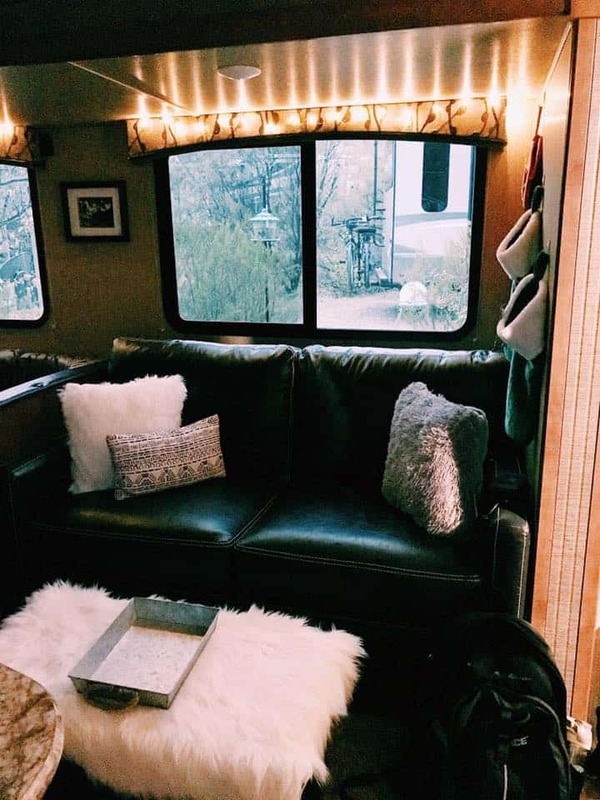 A few added throw pillows in the master bedroom and on the couch is such a simple way to make your RV feel more like home. I also purchased a furry rug to cover the ottoman and a metal tray for a place to set our drinks when we were hanging out on the couch. Since we didn’t paint our walls a lighter color, adding a few white pillows and the rug helped brighten the place up. We quickly found out that command strips like these were our friend if we wanted to hang any pictures up in the RV. We didn’t have a lot of wall space, so just a few pictures did the trick. For some inspiration on wall decor and just decorating your RV in general, be sure to check out our post on 7 RV tours you won’t want to miss. Smells make a difference when it comes to making your place feel like home. At least to me, it does. As I mentioned in this post, it doesn’t take much for your RV to start smelling bad – whether you’re living in it full-time or just traveling for a bit. Opening up a few windows, the door and using an oil diffuser helped to quickly get rid of any lingering smells. Two of my favorite oils to use were eucalyptus during the day because it has such a fresh clean smell and lavender at night to help everyone relax. 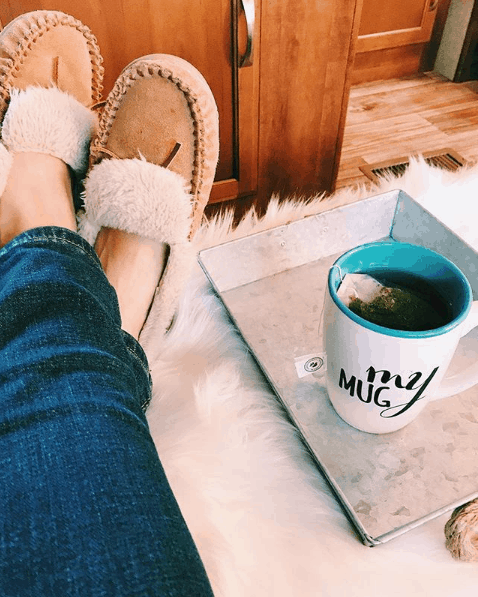 One of my favorite things to do in the evenings when it started getting dark, was to make some tea, put on my slippers, kick up my feet on our ottoman and just sit in silence, appreciating the life I was living. 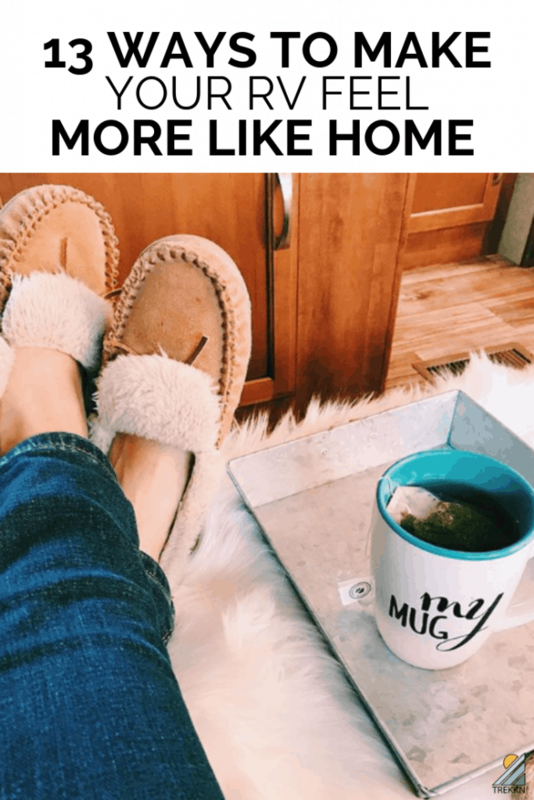 Having the comforts of home like something as simple as your favorite pair of slippers can turn your RV into a space you love to be in. With streaming services, we rarely watch DVDs when living a stationary life. But life on the road can sometimes mean a lack of reliable internet, plus if you’re like us, you were saving your data for work and not streaming Netflix. 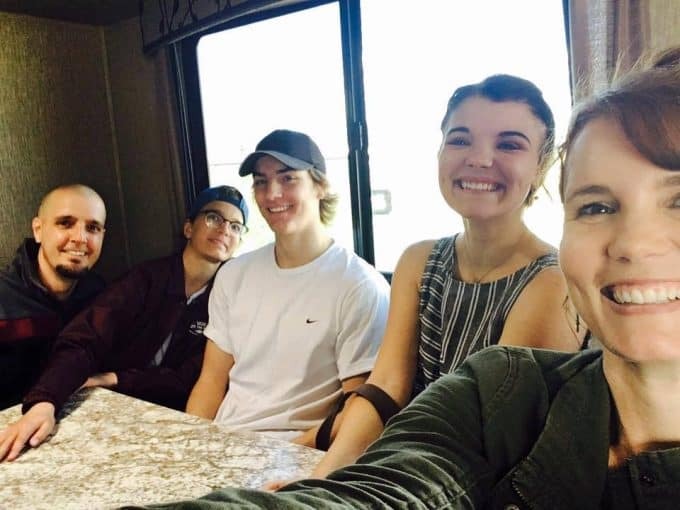 I loved movie nights in the RV, especially around the holidays, so I was very glad we brought a collection of our favorite DVDs with us. I think we can all agree that the valances in most RVs are just plain ugly. And so are the patterns usually. An easy way to remedy this problem is to take them down and replace them with curtains. We did this in our master bedroom, replacing them with white curtains and it brightened up our room quite a bit. If you’ve never taken down valances in an RV before, you might want to watch this video from Mountain Modern Life on the best way to remove them so you don’t end up destroying the walls. As we’ve mentioned before, full-time RVing can be a roller coaster of emotions. There will be hard days. Things will go wrong, things will break, it’ll rain for a week straight and you’ll be stuck inside. One way we tried to diffuse a situation and keep our emotions in check was by playing music. I also loved to play music when I was preparing dinner. Some of my fondest memories of full-time RVing are when I would open all the windows, the door, crank the music a little (not enough to annoy the neighbors of course 😉 ) and whip up something tasty for my family. So if things get tense inside your small space, put on your favorite tunes. We played ours through the blue tooth features on our travel trailer stereo. If yours doesn’t have this, you can always purchase a blue tooth speaker like this one that’s perfect for the outdoors as well. Plus, it just looks cool! Now that we’re done with our year and a half of full-time RVing, there are certain songs we’ll listen to that remind us of specific locations. Those memories and those songs will be with us forever. If you have the room for it, it’s amazing what a plant or two can do for your space. Even a succulent on the counter or table can help liven up your RV. If you’re wondering what kinds of plants will do best in an RV, this article from RV Share about low-light plants should help. We purchased this Gazelle tent and used it as a second living space. This was one of the best purchases we made on our travels. Not only did it provide another area for us to relax in, but it protected us from the bugs. There were quite a few other items we had that made our second living space an area we enjoyed being in. You can see what our top favorite camping supplies for relaxed outdoor living are in this post. RV life gets messy. There’s no doubt about that. But the amazing thing about living small is it takes a very little amount of time to clean and tidy up. I’ll never forget the first time we had people over after we moved into our travel trailer. We hadn’t left Texas yet, so my parents came over for dinner at our campsite. It took me maybe about 15 minutes to clean up and make things sparkle. I knew this minimalist way of living had its perks and this was one of them. 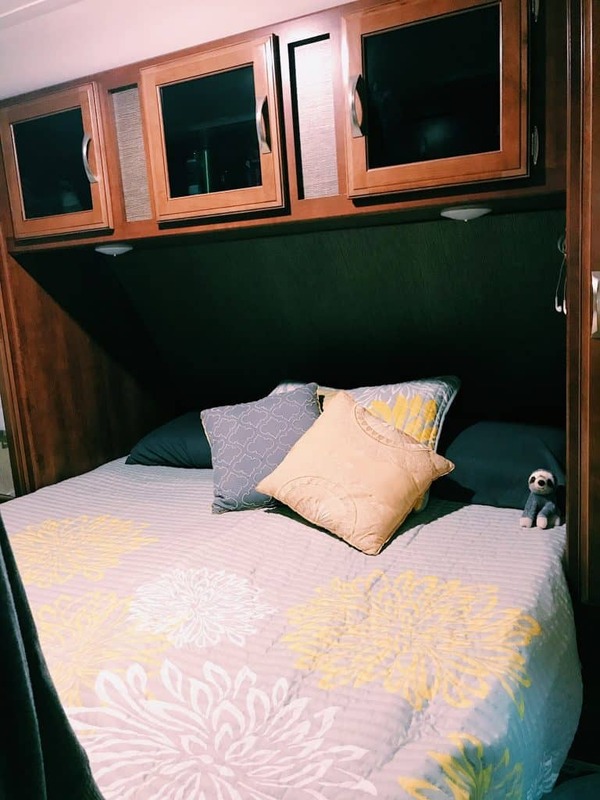 I hope these tips about making your RV feel more like home helps you create a space you love being in. One thing we realized about ourselves while living this lifestyle, is that it doesn’t take much to make us feel happy and make our kids feel safe and secure. 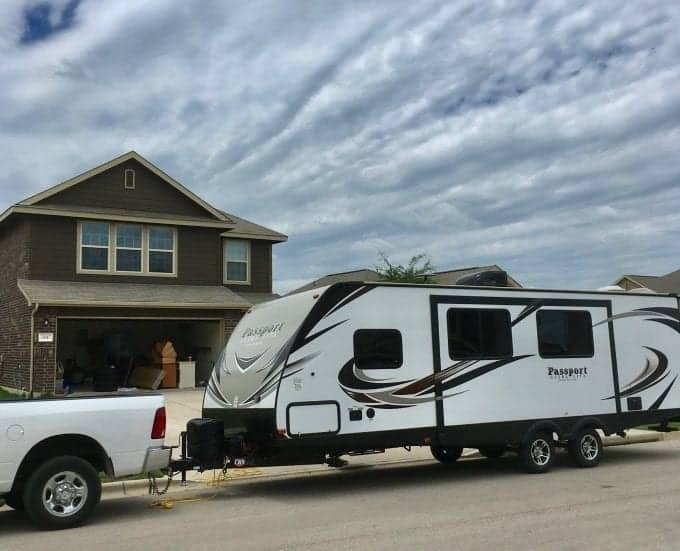 Home really can be where you park it. Great tips Julie! We’re planning our first ever RV trip in the fall. Just two weeks but a hard bed is a hard NO for us! Mattress topper added to my list of must haves.